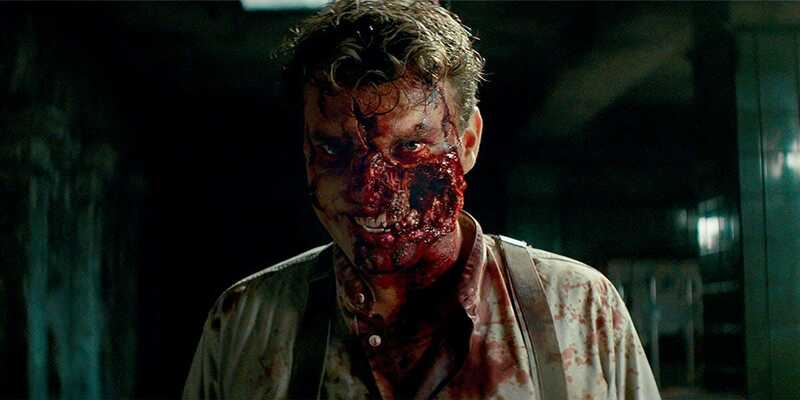 World War II action, Nazis, and Zombies! What else you want? 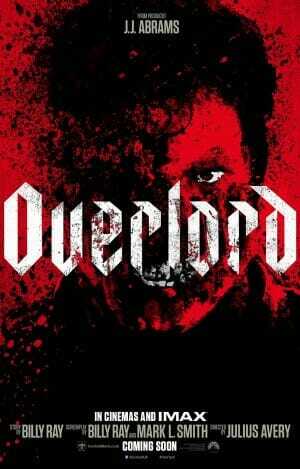 Other than the cool Nazi/zombie movie poster, I had no advance clue about 2018 flick ‘Overlord‘. And, although I can’t say it completely blew me away, I still left satisfied. A solid, action-packed war/horror film hybrid. It starts with a paratrooper squad of fresh-faced American Army soldiers flying over the English channel for D-day. Their mission is to destroy an inland Nazi radio tower before the Allied invasion force lands on the beaches the next morning. And, predictably, things go horribly wrong–just not in a way they could have imagined. First, most of their squad is killed before they can even parachute in when their plane is shot down. Second, getting into this quaint French village unobstructed proves to be rather complicated as the Nazis have built a minor fortress surrounding this tower and the church its built upon. Apparently, some Nazi scientist has begun “experimenting” on the locals, leaving these few remaining American soldiers completely in the dark and totally out-gunned for this growing more perilous by the hour mission. Leading the charge is Private Boyce (Jovan Adepo) and demolition expert Corporal Ford (Wyatt Russell). 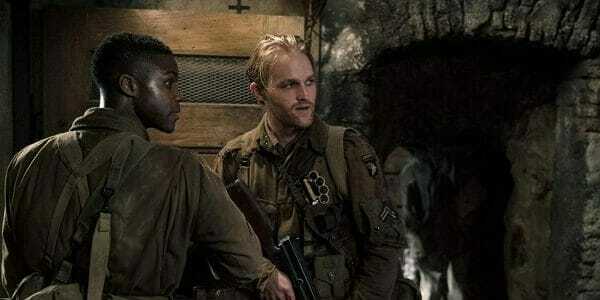 With able support from squadmates played by John Magaro and Iain De Caestecker, the lovely villager Chloe (Mathilde Ollivier) who shelters them, and “Big-Bad” Nazi Captain Wafner (Pilou Asbæk) whose in charge of removing local “obstacles”. Director Julius Avery impressed with 2014’s ‘Son of the Gun’ and again shows a flair for in-your-face action and high-tension character dramatics. He gets the absolute best out of an undercooked script and a wildly diverse cast of characters. It ain’t the Nazi/zombie masterpiece we’ve been hoping for. But, it’s really rather good–at times, even great. Boyce and Ford form a battle plan. Private Boyce (Jovan Adepo) is out of his depth. Corporal Ford (Wyatt Russell) is in his element. And Captain Wafner (Pilou Asbæk) has changed the rules. Jovan Adepo does fine with the endearingly naive “Pvt. Boyce“. Highlighted in a wonderfully tense “deer in the headlights” sequence when Boyce unintentionally stumbles into this Nazi madhouse of horrors. And during a breathless one-take styled, explosion filled finale escape. With a couple of juicy action/horror bits thrown around in-between to give the remaining cast something to do. 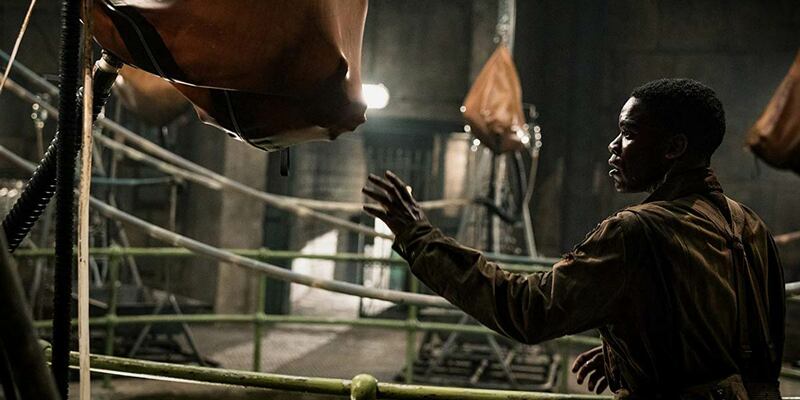 Still, I was wishing for more zombies, more true scares, and more emotional punch. Most of these characters are just not that memorable. However, Wyatt Russell (Kurt’s son) perfectly embodies the battle-hardened, burned-out “Cpl. Plisken Ford“. While Pilou Asbæk demonstrates why he’s become a goto bad guy as the ruthlessly OTT “Wafner“. These two tear through the cheesy macho dialog and each other with equal, reckless abandon. 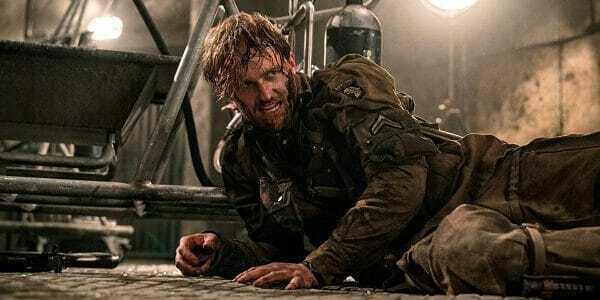 Thus, with better than average polish, some notable character-defining performances, a few genuinely horrific moments, and a decent amount of World War II battle thrills, ‘Overlord‘ is an easy sell for any action fans looking for a fix. Focusing on the action, the settings, and the horror keeps us entertained without any needless character development or story depth. A joyous, thrilling diversion.